I have a long list of chicken recipes collected over the years. Although I don't follow or read them anymore, still it brings back the memories when I was still a newbie in the kitchen. My love in the kitchen grow bigger to the point I dreamed of having my own cooking show, lol. Some of my favorite dishes are chicken tinola, afritada, ginataan manok with malunggay and the famous chicken adobo. 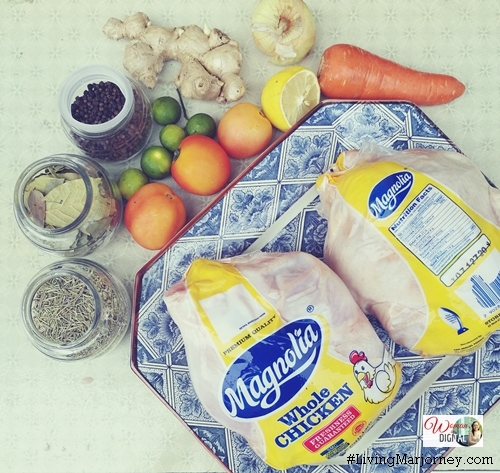 Whatever dish to cook, I prefer Magnolia Chicken. There's always a Magnolia Chicken Station in any supermarket. You will find the chicken part you need - whole chicken, chicken pieces consisting of two breast halves, thighs, wings, drumsticks. They are always fresh with skin creamy white to deep yellow. Last Sunday was my birthday and so I decided to cook something special - Easy Chicken Pot Roast and Pansit. I was inspired by the dish Chef Llena Tan Arsenas prepared in her show, Home Foodie. 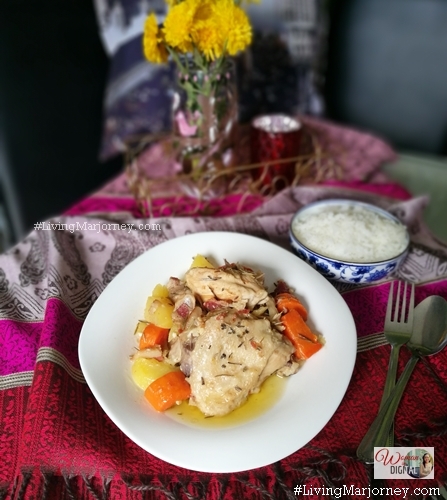 It's a mouth-watering and easy to prepare 'madalicious' chicken recipe. With chicken pot roast, it only took me an hour from preparation to cooking. I swear it tastes really good. I recommend you try it at home, your family will be surprise. My brother who visited me and tried this chicken dish said it tastes like restaurant food. Chickens are first classified by age and weight. Take note that young chickens are tender and cook quickly; older chickens need slow cooking to make them tender. 1. 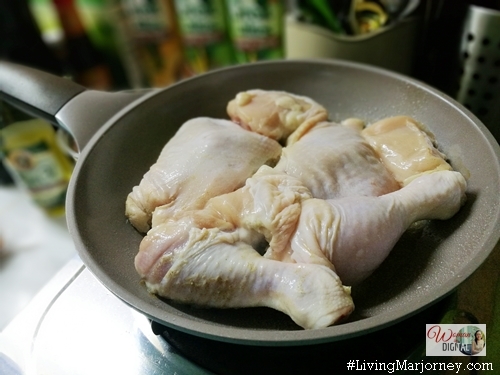 Rub chicken inside and out with salt and pepper then fry in oil. Brown skin well on all sides. Set aside. 2. In a thick based pot, heat leftover oil from frying chicken. Saute onion, garlic and bacon. 3. Add chicken back side up. Pour calamansi juice all over and sprinke with rosemary. Add chicken stock. Cover and simmer chicken for 45 minutes or until tender. Turn chicken. I received more than two-thumbs and a kiss from hubby. My brother even asked for the recipe. 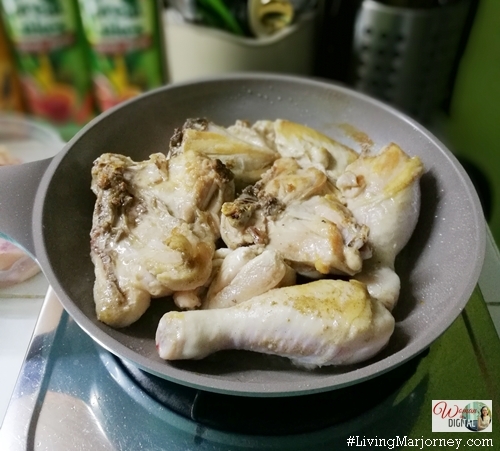 I guess the secret to a delicious Chicken Pot Roast are the fresh and natural-ingredients such as dried rosemary and calamansi and of course, the main ingredient which is Magnolia Chicken. I also use organic potatoes and carrots. Make sure you have enough rice as well. If you have a bigger pot, cook a whole chicken instead. Let your guests do the slicing to get the chicken part they want. 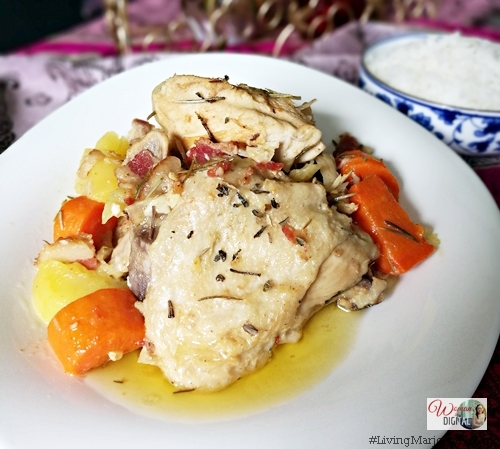 I hope you will try this delicious and easy-to-prepare Chicken Pot Roast. You'll never go wrong with Magnolia Chicken.